Learn to make ginger soda and enjoy a refreshing and fermented drink. This year I am planning to add in more fermented foods to my diet which helps bring in more probiotics to the gut. Right now I am reading "The Art of Fermentation" by Sandor Ellix Katz which is an encyclopedia of fermenting foods and recipes. I came across this natural soda recipe a while back from Wellnessmama that I had in my To Test File. This one passed my test and I am loving to have a little cup of this natural ginger ale. 1. Cut 1.5 inch piece of ginger root and slice and finely chop. 2. Place the chopped ginger root into a clean glass mason jar and add 2 Tbsp of sugar. 3. Add 2 cups of filtered water to the mason jar. Chlorinated water can affect the ginger bug so do it is recommended to use filtered water. 4. Stir with a wood spoon - not recommended to use metal. 5. Cover jar with a coffee filter or paper towel and secure with a rubber band. 6. For the next 5 days, add 1 tbsp of chopped ginger root and 1 tbsp of sugar to the jar and stir with a wooden spoon. -Depending on the temperature, it may take up to eight days of adding sugar and ginger to create the desired culture. You can tell if the culture is active if there are bubbles forming around the top of the mixture. It will fizz when stirred and it takes on a sweet and mildly yeasty smell. The water will also become cloudy. If mold should appear on the top, you can scoop it out once, but this means the temperature may be to warm and or not getting consistently fed and so mixture may die. If so, start over and remember to be consistent each day with the feeding procedure. 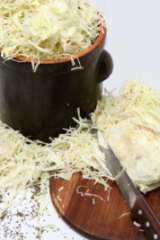 - It is recommended to keep the culture away from other cultures such as sauerkraut or Kombucha as it can cross culture. 7. Once the ginger bug has cultured it can now be used to create fermented sodas and drinks at the ratio of 1/4 cup ginger bug starter per quart of sweetened herbal mixtures such as ginger ale, apple soda, or root beer. 1. Place 3 cups water in a saucepan with minced ginger root, sugar, (molasses if needed), and salt and bring to a boil. (This step is to infuse the ginger and sugar. It is your call if you want to simply heat on low to forego the boiling step and I did not bring my mixture to a boil and it worked. These are simply steps and not a complete science, so feel free to experiment on this last step). 2. Simmer the mixture for 5 minutes until sugar is dissolved. 3. Remove from heat and add the remaining 5 cups of water and allow to cool at room temperature before moving to the next step. 4. Add fresh lemon or lime juice and ginger bug. Stir well. Pour into a 2 quart glass mason jar with a lid. 6. Strain the mixture before serving to remove all the ginger pieces that have settled or may be floating in the mixture. I love that I am learning how to make natural fermented sodas that contain beneficial probiotics and enzymes. I hope you will have fun with this too as making your own natural soda is such an old fashion treat.